Used Elegant Limo to come and pick me up from the Orlando Airport and wow. It was a Great! I felt like an VIP coming home! The kids came out the meet me and were all smiles with the Limo there. It was a fair price and a very relaxing ride. Thanks guys See ya next Airport Trip! Thank you for such a great evening for my parents 50th Anniversary. Anyone needing special service, such as reservations at the Chart House should contact them. The dinner was designed around the two of them. We were promised the red carpet treatment and they certainly delivered. Everyone in our group was delighted. Elegant is by far the best. Thank you for the great car and wonderful service. We had a really good time and everyone made it home safely.Thank you again for the deal you gave us and for making sure our night out was successful. I would recommend your company to everyone. Thankyou for your friendly and efficient service from Orlando to Daytona Beach and back. My husband and I enjoyed ourselves and found you very helpful. Best wishes in the future. I am sure your business is and will continue to be very successful. Thank you for sending Michael as our driver to Orlando Airport. My grandson and I were still half asleep at 5 AM when he arrived. He perked us right up, spoke of interesting facts along the way like pointing out the previous nesting of the Eagle's. We chatted and relaxed at the same time. I'm looking forward to booking with you again in feb to go to the Amway in Orlando. Great service as ALWAYS. Hi Mike and Marlo:Just wanted to tell you what a wonderful time we had in BOTH limos. So many friends have called me after the party to tell me how much fun they had. Elegant Limousines were gracious to make the stops we requested and were prompt. anything. There are other limo companies out there, but I'm sure we chose the best!! We couldn't have asked for more! The limos were very clean and well stocked with all that we needed. our professional, black tie service made my event so special and memorable. so I will have to wait for their return to send those photos to you from their cameras. Wow!! What a blast!! I had so much fun with Mike and Marlo tonight!! I can't thank you two enough for everything, you are such amazing friends! The limo looks amazing!!!! I absolutely love it, but you already know that!! Thanks for the best ride in the place and the laughs tonight! Spending time with you two tonight was a blast!!! Keep being you I love you guys!! I hope everyone who came out tonight had as good of a time as we did! There were really some great floats tonight and lots of smiles! The love was in the air and it was so refreshing! I hope everyone has a safe and Merry Christmas and remember~ People helping people, its a beautiful thing! Thank you guys so much for your service on Friday! My engagement went fantastic. Caitlin called it "magical". I've attached a few photos of us in the limo for you guys! Elegant Limousines picked us & our luggage up at our home in Port Orange & drove us to right to our ship docked @ Port Canaveral where we boarded our weekend cruise to the Bahamas - no fuss, no muss, no traffic to worry about, no luggage to lug around: we rode in total luxury & relaxation thanks to Mike, our limo driver. We had the same excellent service from his wife, Marlo, on the trip back home from Port Canaveral: she picked us up promptly at 9:00am, loaded our luggage in the limo, & drove us home to Port Orange; again, no muss, no fuss! Ice cold water & soda was provided on both trips as well as a variety of DVD'S from which to choose. I/Linda was able to lay down on the padded leather seat & take a restfull nap on the way home. The interior of the limo was immaculate & very pleasant on the eyes, especially the fiberoptic mirror in the roof. The exterior of the limo was clean & beautiful as well. This was our first ride ever in a limousine & we are looking forward to the next one which we have already scheduled with Elegant Limousines during the month of July !!!! Thumbs up for Elegant Limousines. You couldn't ask for a better couple to serve Palm Coast. They were at our Christmas Party and let me just say if you want professionals, call Marlo and Mike. Keep up the awesome job. Another vote for Elegant Limos. Our daughter got married on May 30th, and they were wonderful. The little things like sparkling cider and flowers to match the wedding colors were an extra nice touch. I wouldn't recommend anyone else. This company will treat you like family. They are so reliable, I never have a second thought about whether they will be on time with their spotless vehicles. I'll never use any other service 'cause Marlo and Mike are the best! Mike and Marlo do a great job. They take me to the airport at very early hours and are always there! Their cars are spotless and their driverss courteous. I have used them for three years now and have neve had a bad experience! Thank you for the terrific job you did transporting my elderly mother home from the Orlando airport. Not only was your service efficient and reliable, but also the reassurance you showed my mother on her first limo ride made all the difference. We shall definitely be using your service in the future. I just wanted to tell you what a wonderful time the kids had Saturday night with Raymond, your limo driver. He was here to pick them up early, let us have all the time we needed for pictures, very courteous and mannerable. He had the "red carpet" out for them,"literally" and when he let them out for their meal, he was there to pick them up within seconds! All in all, I think the limo ride was their favorite of the night! 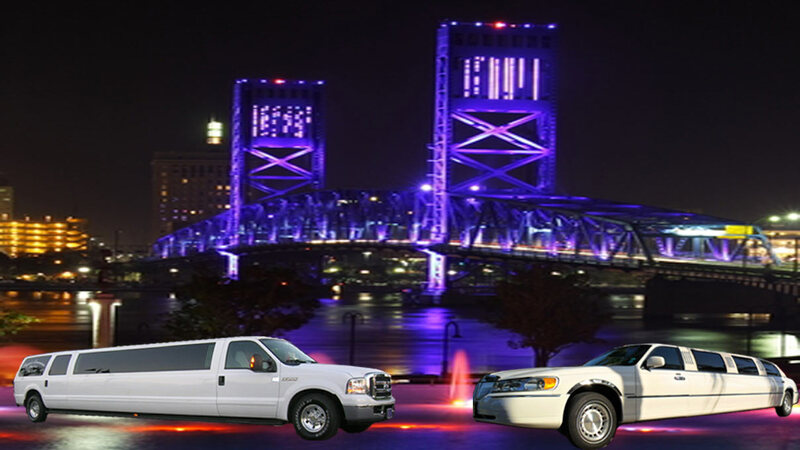 We just wanted to say thank you for the smooth and easy transportation to and from the Jacksonville airport on Monday (04/13) and Thursday (04/16). As owners of Elegant Limousines we would like to let you know that Raymond was a wonderful driver. You were correct when you said he was one of your best! The next time we need car service we'll be sure and use your business as well as recommend you to others. Thank you so much for making our day so special. You guys went above and beyond our expectations. You literally "Rolled out the Red Carpet for us"
I just want to thank you and your company for the exceptional service that you provided for Monica's 21st birthday! It's really hard to find a great limo company with people that care, and we have found that in you. We will recommend you to all our friends and family. Professional service! The driver was prompt and got us to our destination quickly and safely. My children LOVED their first experience riding in a limo, so much that my son misplaced his glasses during the ride. Marlo is a gem! She found them and arranged to have them sent to my home. You will not be disappointed choosing this company. Their service is unmatched! My Driver, Raymond was early, professional, and put in to practice that he and his company put safety first. Ray safely avoided a potential collision by getting away from drivers that appeared to be racing and prevented him from exiting the highway. Being resourceful, he still managed to get me to the airport by the requested time. I continue to use Elegant Limo for many reasons, but two important ones are their attention to safety and their customer service attitude. Keep up the good work Marlo, Mike, and driver team! My driver, Ray, from Elegant Limo was timely, courteous and professional. I will certainly use Elegant Limo again. My experience with Elegant Limo was a very good one. They were timely, courteous and professional. I would recomend them highly. Just writing to share my Thanks for all you and your staff did transporting our guests to and from the Orlando, Jacksonville, Daytona Beach Airports to the Ginn Hammock Resort for our meetings on Sept 8th & 9th in Hammock Beach. Thanks to the Diligence of your team and their attention to detail, all the rides and shedules over both days went off without a hitch . The Drivers were Exceptional and Extremely Accommodating and you were flexible with the numerous schedule changes we encountered. We Will certainly contact you again should we have transportation needs within your area.